Free shipping. Buy direct from HP. See customer reviews and comparisons for the HP 64XL High Yield Tri-color Original Ink Cartridge. Upgrades and savings on select products. HP cartridges are designed with HP printers to offer outstanding photo and document quality. Print high quality black text, brilliant color graphics, and get unique shades with cartridges built for reliability. Get top quality prints with cartridges designed and tested with high standards.Print up to twice as many pages with Original HP high-yield ink cartridges. HP 64 ink will deliver top quality photos or documents. HP 64 ink cartridges deliver authentic colors so all your prints will shine.Get sharp text and vibrant graphics for all your in-home office documents.HP 64 ink cartridges use black ink to give you more shades that make your photos pop off the page.Count on HP Original inks for fade and water-resistant photos that last for decades. Get top quality prints with cartridges designed and tested with high standards.Print up to twice as many pages with Original HP high-yield ink cartridges.HP 64 ink will deliver top quality photos or documents. Brilliant color performance with Active Ink Balancing—produce sharp documents for the life of your tri-color cartridge.Avoid wasting ink and get alerts when your cartridge is low so you can replace them in time.HP SureSupply makes it easy to repurchase Original HP Supplies from any device when you’re running low. 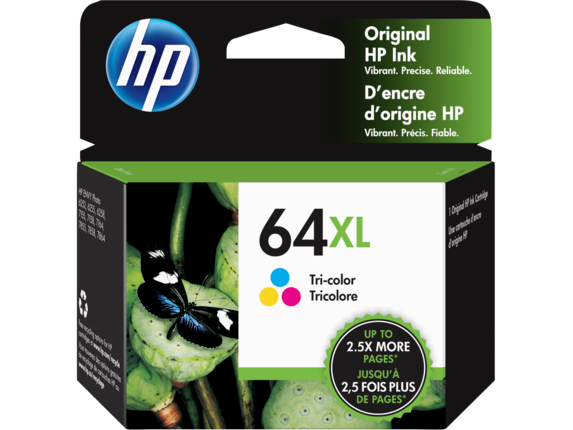 HP 64 ink cartridges are built with recycled material and can easily be recycled for free.